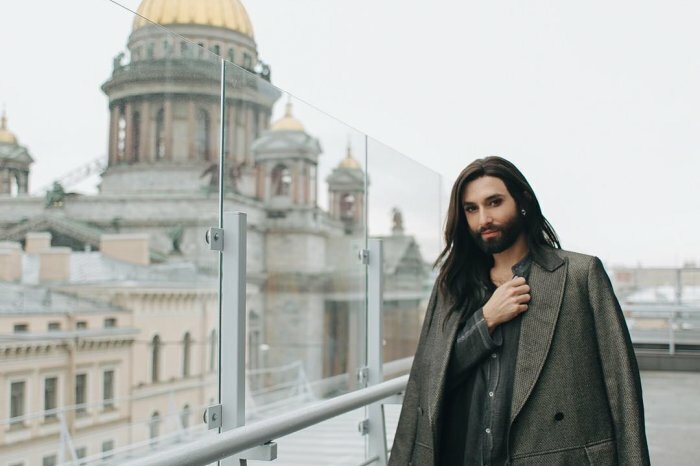 When the bearded singer Conchita Wurst won the "Eurovision" 2014 many Russians feel strange. But when Conchita (aka Thomas Neuwirth) announced that he was going to St. Petersburg, State Duma deputy Vitaly Milonov, known for his anti-gay propaganda, was kind of furious. Deputy of the State Duma even sent an appeal to the Migration Service of the city. According to him, Conchita's visit - a violation of law. - All her look promotes Western values ​​that are abhorrent to our people! - said the deputy. But the migration service on the MP did not respond to treatment, and Conchita in town yet arrived. 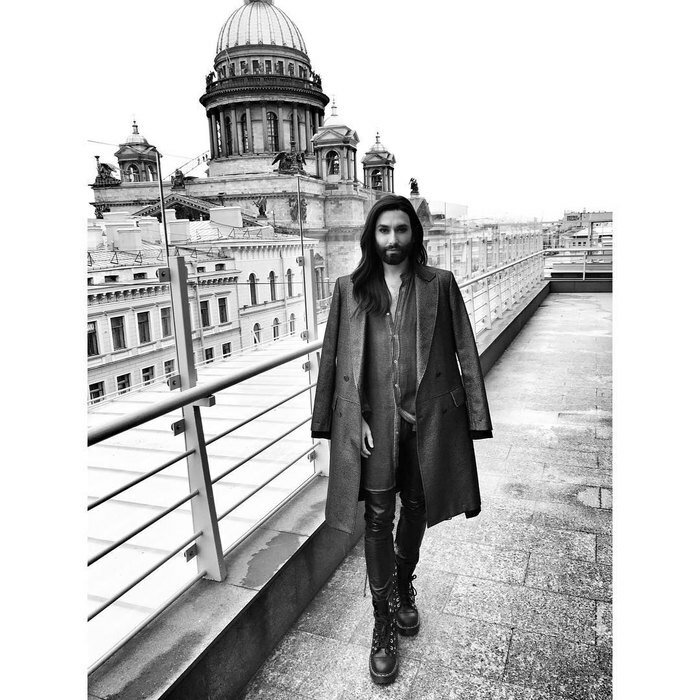 Wurst was in St. Petersburg to participate in the festival "Side by Side". It is conducted by representatives of the LGBT community for several years. Milonov does not like them too. But Milonov is now moved to Moscow, so festival participants feel more free. Wurst presented at the festival is one of her favorite movies "The Cat." The meeting was held at the cinema "Moscow" hotel. On the show idol was awaited by a huge crowd of fans. Everyone who bought a ticket to visit after the show pictured at a meeting with Conchita. A guest from Vienna like St. Petersburg. Conchita even said she would not mind to buy a house in the northern capital. They say that architecture is strongly reminiscent of the Austrian. How do you like St. Petersburg? European atmosphere is felt? - I love Petersburg. Even though I had grown accustomed to the European architecture in Vienna and other cities, you know, my mouth dropped open when I saw your city. It is beautiful! And these palaces! Oh God, now it seems I want to buy myself one of them (laughs).- A lot of palaces, this is what I need! - she said, speaking at the festival. Then the truth, yet noted that she can not afford the purchase of the palace. ​Are you coing to the opera or our world famous Mariinsky Theater? - I would love to, anyway, I love classical music. A list of places required to visit in St. Petersburg, just great! At this time, I have the luxury to stay in the city more than usual, but as a rule, everything happens like this: I can, for example, to come to Rome, to admire its beauty, and the next day had already forgotten what it looks like. Answering questions and leading a replica of the hall. People interested in many things: for example, whom she considers a woman or a man. Conchita spoke in this spirit that it is not so important. - Someone sees me as a man, and some women - that's all, - said the outrageous singer. We talked about the animals. - I love dogs and cats and, but unfortunately due to my active life, and tight tour schedule can not afford them. After all, they too need love, and I will not have time for them, - Conchita said. Just fans asked why Thomas did not come to St. Petersburg before? - I know what you have here the laws, and what it is related to great danger, so I was very happy when i got the invitation and the opportunity to come to the festival, when they told me that they can ensure my safety here, - says the artist. By the way, at the cinema where the meeting took place, the police made every half hour tour and watching everything going on. After meeting the singer performed at a nightclub. And tomorrow she has come back to her homeland.